This is a quick little bookmark Mom (Julie) put together with the snowman paper pieced and the little snow swirl embossed in the background. Quick & cute- gotta love it :) This would be a great add on anytime you give a book as a gift this winter season! This might be my favorite card of the bunch... mostly because of the adorable little fox, I just love him! I created a snow globe shape with circle nesting dies and the base is 1/2 of a label die from the QK Holiday gift set (shh... they're not supposed to be released until Tuesday!). The sentiment is from a different Kim Hughes set, which I thought was perfect with my striped tree! Don't ya love the liquid applique 'snow' on my fox? So much fun (and we have a bunch in stock right now- get it while you still can)! This one's pretty self explanatory- quick & simple, but lots of fun! Notice the icicles under the sentiment? I stamped them on QuicKutz's self adhesive vellum. 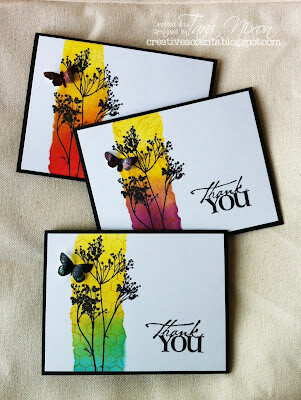 The paper on these first two cards is by My Minds Eye- I love the whimsical, bright colors & designs. Have you noticed that I'm addicted to Kraft cardstock? I swear it goes with everything... I love this bare tree with one lone ornament on it- I colored it in with a Copic Spica pen for glittery fun and added lots of white stickles for a frosty finish. My patterned paper is from Cosmo Cricket. 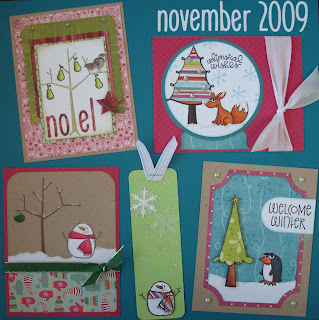 Tanya used Basic Grey papers for this fun partidge in a pear tree card. I won't say much more, except that this gives some more sneak peeks from the QK Holiday gift set. Shhhh... don't tell! This is a bonus card that didn't fit on our sample board... it was a collaboration between Tanya & I :) We used 'rock candy distress crackle paint' on the igloo and were clever enough to make the candy cane a fishing rod- gotta love it! I think these penguins look a bit sassy... like they're thinking up some witty comeback for whatever you might throw their way! Hope you enjoyed the cards and that you'll get a chance to make some fun winter cards with your stamp set soon! I think we have a couple extra sets (or we did...) so if you're not on our SOTM list, you can purchase a set in the store. I gotta say these look so much better in person! !That fox ROCKS!